"The boat is a 1989 22-foot Boston Whaler built by Whaler's Commercial Products Division for a special government contract. 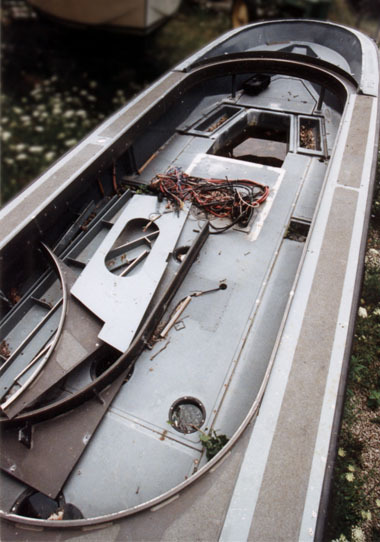 Pictures of the 22-Raider can be seen in the Boston Whaler literature from the early 90's. 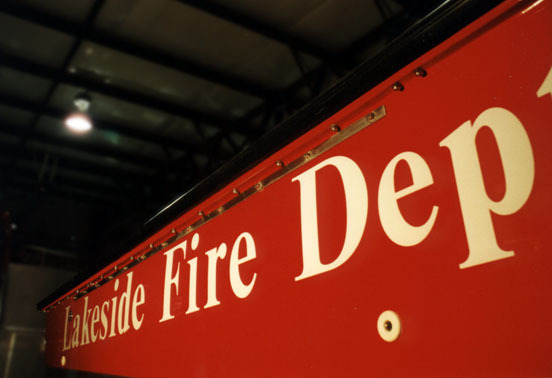 "When the Lakeside, Ohio Fire Department purchased the boat and trailer from the government it had been well used during Operation Desert Storm. Over 7,000 hours of volunteer work in a 24-month period were needed to rebuild the boat. Businesses in the local area also contributed a lot of help. "The entire interior was non-skidded with gelcoat to cut down on maintenance and enable us to do easy touch-ups. A standard high-gloss interior would not look pretty after one season of running dive and rescue calls. Jon Hart, owner of Dockside Fiberglass Repair in Marblehead, applied the gelcoat after we prepped the interior to his specifications. "Don's Body Shop in Marblehead applied the red exterior paint after we again had accomplished all of the prep work to Don's specs. With the hull upside down on the trailer, the boat barely fit in his paint booth. "The engines were taken from another Ohio Department of Natural Resources Whaler 25-foot boat." This is hull as it was received. The console and leaning post were included but not attached. The large bow opening never had a hatch cover; that is where the front gunner stood! The aluminum bow deck was missing. Notice the width of the aluminum gunwales. 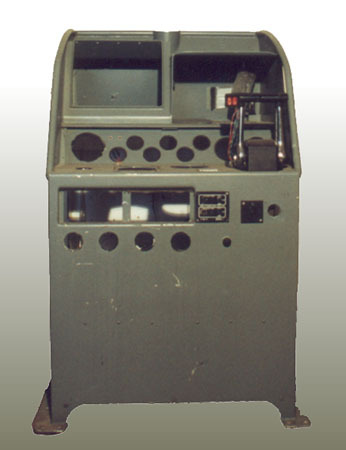 The original olive drab console. A twelve-inch section was removed from the front and everything above the gauge panel was reworked. 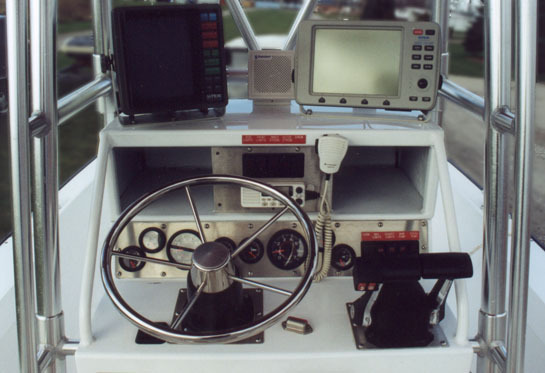 When the console was remounted in the boat, it was moved forward about two feet to create a larger rear cockpit. The gauge panel is brushed stainless steel. The white paint is AWLGRIP. 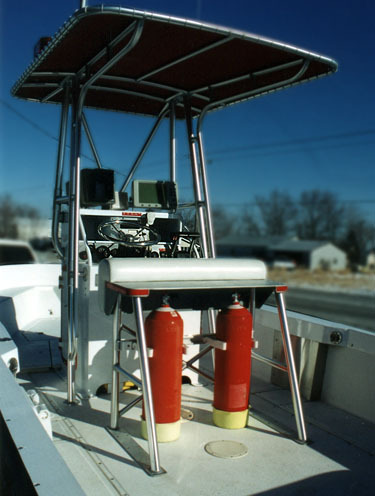 Across the top is a SITEX 10-inch DGPS Plotter, radio loudspeaker, and SITEX 8-inch Color Video Depth Sounder. The custom red engraved switch panel legends can be made at any trophy shop. Keith Joy at Lakeside Marina designed the T-Top, and he also supervised and guided the volunteers through the fabrication process. Custom Canvas and Upholstery in Marblehead stitched all the canvas and upholstered items. 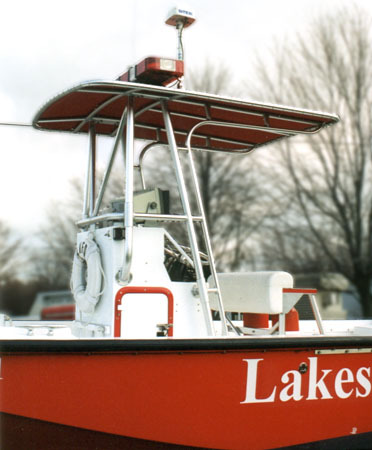 A red light bar mounts above the T-Top, along with the DGPS and VHF radio antennas. An upholstered rear seat was fabricated. 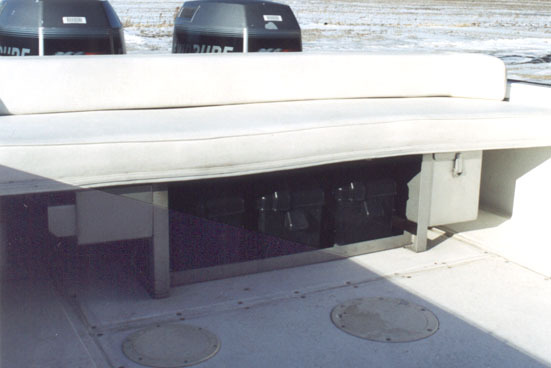 Below the seat are custom stainless steel electrical boxes. The box on the left contains the three battery switches and the battery conditioner. 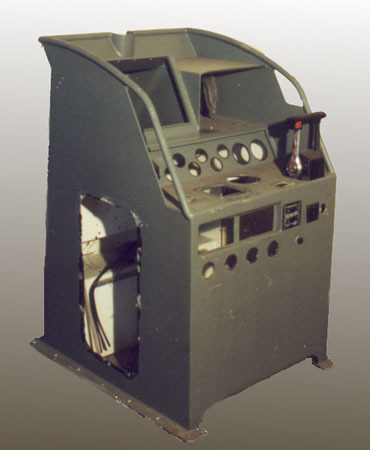 The seat base has been removed to show the components below it. In the center are three large batteries. 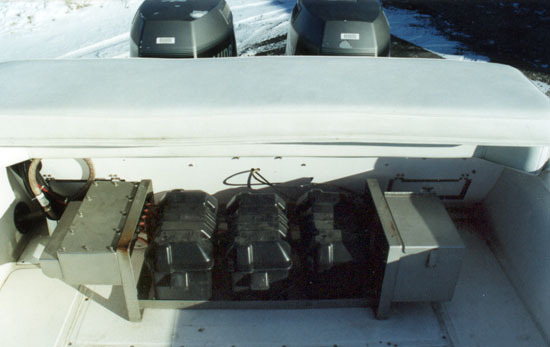 The box on the right contains the hydraulic units for the trim tabs. More details of the rear seat and the battery bank are shown here. 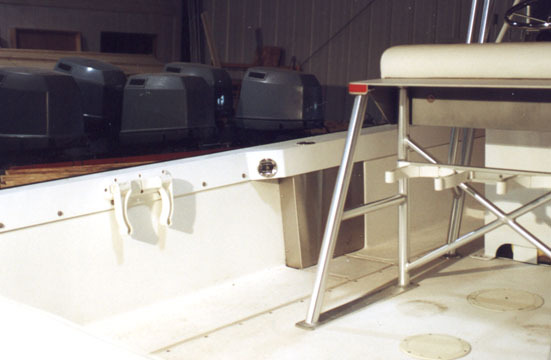 The 1/4-inch thick aluminum gunwales were narrowed and re-welded to create more cockpit width. The molded cover plates over the fuel filler hoses were replaced with brushed stainless steel. 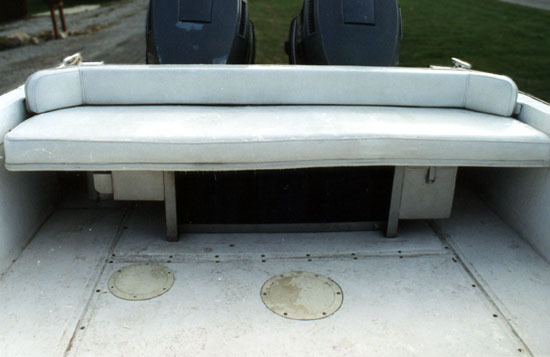 More detail of the gunwale rework and aluminum kick panel covering the fuel fill. In the background are plenty of spare engine parts. 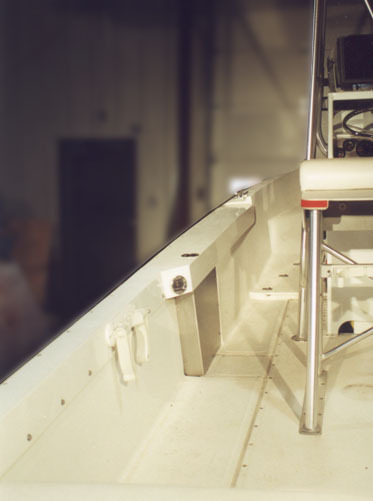 The aluminum gunwales are through-bolted to the hull top-to-bottom and side-to-side. The original aluminum backing strip was replaced with one made from stainless steel. A custom leaning post was also fabricated. 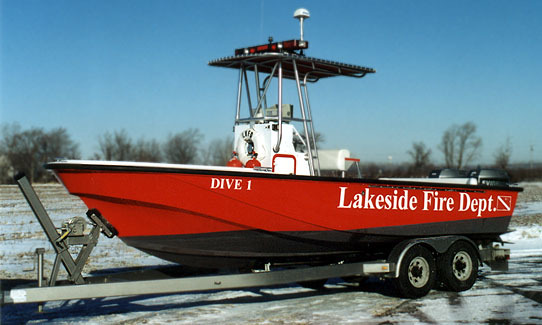 The trailer is an original CPD heavy-duty model, built by LOAD-RITE under a Boston Whaler contract. The frame is heavy wall 3-inch x 6-inch rectangular tubing. There are eight Stoltz keel rollers and full-length carpeted bunks. 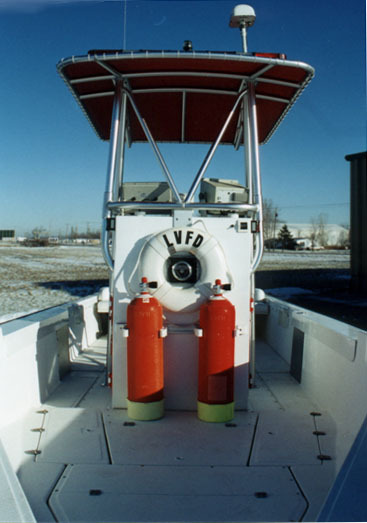 The entire assembly of boat, motors, and trailer is designed to be sling loaded with a crane or helicopter if needed. There are four lifting points on the trailer for this purpose.